After I completed my Permaculture Design Course (PDC) I decided to obtain a 1000l IBC (industrial bulk container) to capture and store water in over the winter months ready for the summer. 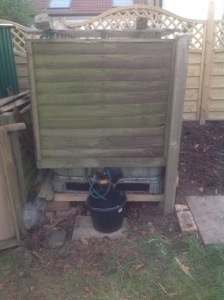 It is a bit ugly so I tucked it away behind one of my sheds (I have two!) and ran a hose pipe from one of the water buts to the IBC. I purchased a 12V caravan pump for a few pounds off eBay and acquired a car battery from a Freegler. Very soon I had 1000l of water ready for the spring. The IBC has worked quite well but it is made of translucent plastic so there is a risk that the water will go green if left for any length of time. The IBC also looks ugly and with new neighbours I thought I ought to do something about it to make it less of an eye sore. A luck would have it, over the winter one of our neighbours decided to replace his fence so I acquired his old panels, just right for fitting around the IBC, so today I drained the remaining water, moved the IBC to rebuild it’s base and make it a bit higher off the ground, replaced the IBC and fastened the panels around it with a piece of old ply and a pallet on the top. 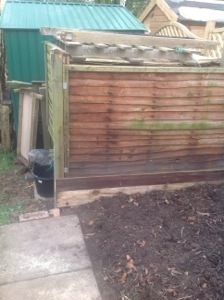 It also gave me the chance to clear and tidy the soil next to the IBC so I am now trying to decide what to grow there. Another change I want to make is to see if I can use gravity to fill the tank. We are planning to replace the guttering and downpipes on the house in the near future as part of installing external insulation so it would be a good time then to experiment.